Israel is a beautiful country, there’s no denying that fact. With its diverse landscapes and scenery, ranging from desert in the south to lush green hills in the north, that beauty is incredibly varied, and whilst traveling in Israel you are almost certain to, very often, gasp in awe at the beauty this land has to offer. Here are five of the most beautiful places in Israel which you might like to include when deciding what to do in Israel. The Hula Valley in the far north of Israel may appear very different to the sandy desert that many people consider Israel to be covered by, but this spot, which is one of the most important stop-off spots for migrating birds and as a result, one of the best bird watching sites in the world, was until recently a malarial swamp which was drained and rehabilitated. Today, people visit from around the world just to watch the birds, although the tranquil outlook and peaceful leisure activities make it a great place for all to visit. The Ramon Crater in the Negev Desert was, for centuries a wonder to those who lived in the land. Thought to be the work of an asteroid which collided with the earth and created a huge crater-like landform (and a number of smaller ones nearby), it is now known that the Ramon Crater is actually the result of water erosion when the desert was, thousands of years ago, covered by oceans. With its incredible outlook, and the unique climate and wildlife within the crater itself, the Ramon Crater is definitely one of the most beautiful places in Israel. Many visitors to Israel miss the Negev but check our Negev Tours for ideas about how to visit. Jerusalem, the ‘City of Gold’ is beautiful. Whether you observe it from up close, walking through the narrow streets of the Old City, or step back and take in the panorama from one of the amazing outlook spots such as the Haas Promenade, the glistening stone which symbolizes this city, considered so holy and important by so many people, and the magical approach to the city through the lush Jerusalem Hills make it one of the most beautiful places to visit in Israel. 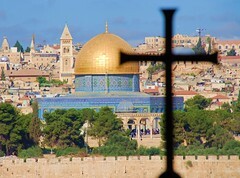 There are many ways to visit Jerusalem, but check out our Jerusalem Tours for some great options for starting to explore this city. The Dead Sea is the lowest place on earth and whether you actually go in it or admire its beauty from further away, there is little doubt that this is one of the most beautiful places in Israel. Its saline bright blue waters combined with the bright sunlight of the surrounding Negev Desert, create magnificent sunrises and sunsets which people visiting Israel from around the world marvel at every day. Visit the Dead Sea on your own, or take a tour to Masada and the Dead Sea, or the Dead Sea alone. 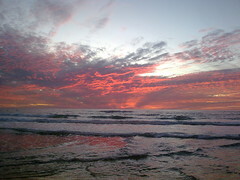 Israel’s Mediterranean Coast produces amazing sunsets! Whether you are walking along the promenade alongside Tel Aviv Beach, sitting at the beautiful archaeological site at Caesarea, or observing from high atop Mount Carmel, you will likely be blown away by the magnificent shades of red that the sky will turn as the sun falls beyond the horizon. Israel is a beautiful country and beauty is subjective! We’re sure you will have other places in Israel which you will consider to merit a place on this list… why not comment below and leave your favorites, and if you can get enough people to like it, we might just be able to add it on to this list!